Statistics show that, in 2016, deductibles through the different plans of the Obamacare Act (Gold, Silver, and Bronze) increased 8.4% or $265 on average. Also, in some states, the average increase skyrocketed to $1,395. Besides the fact that this is hardly an affordable health insurance, these high deductibles have increased what the average family should pay out of its pocket to receive health coverage. So, instead of lowering the costs, the Obamacare Act has driven the insurance costs up and has restricted access to lower-income families. With Affordable Care Act deductibles and premiums skyrocketing, Health Savings Accounts are becoming increasingly valuable. In fact, HSAs are one of the fastest-growing medical care plans because you are actually managing a savings account for your health. Also, HSAs serve as a reimbursement program and most employers agree on contributing to these tax-advantaged medical plans as an additional employee benefit. So, if you face financial hardships or are simply looking for an affordable health insurance plan and you don’t know how much money you should save and how much money you can spend on the plan, this HSA for beginners guide will, hopefully, answer all your questions. A Health Savings Account (HSA) is a tax-exempt savings account that allows you to contribute and withdraw funds for your medical expenses. By setting aside a specific amount per year on your HSA, you have instant access to the amount of money you need to cover for qualified medical expenses. The money that you contribute is tax-exempt because the IRS considers HSAs as health insurance plans for tax purposes, and therefore, any income received from a health insurance plan is tax-free. Which expenses are covered by an HSA? The HSA is designed to cover your own medical expenses as well as the expenses of your spouse and children, provided that these expenses qualify for the HSA account. Such qualified expenses include doctor visits, dentist payments, MRIs or scan CTs, home care, over-the-counter drugs, weight-loss supplements, nutritional supplements, and vitamins prescribed by a medical practitioner, drug prescriptions, emergency treatment, mobility aid, medical trips and medical equipment. Also, psychological treatment, eyeglasses, chiropractic and physical therapy services, hearing aid, and quit-smoking programs are covered. Normally, you are the main contributor to your HSA account. However, one of the main reasons that HSAs are attractive is the employer contributions as an additional benefit. Your employer can match your HSA contributions up to a certain amount, let’s say the first $500 you put into the account. In that way, you get $1,000 matched annually. In case you have more than one HSAs, or your employer contributes to your HSA, make sure not to exceed the maximum allowed contribution for the year. How much money should I put into an HSA? 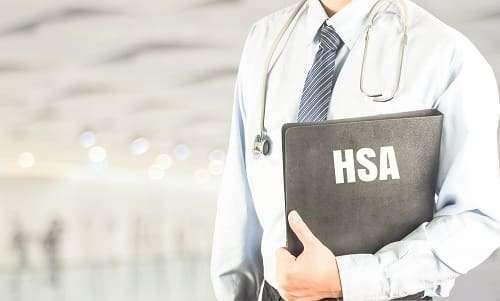 In this HSA for beginners guide, we strongly recommend that you put the maximum allowed contribution into your health savings account. For 2017, this is $3,400 for an individual HSA and $6,750 for a family HSA. If you are 55+, you can contribute $1,000 each year as a catch-up contribution. Contributions can be in one lump sum or in different payments throughout the year. In this case, you are making after-tax contributions (i.e. from your paycheck), and when you file your taxes, you get an above-the-line deduction, which adjusts your gross income to the tax-free contributions. Put simply, you can claim a tax deduction for the contributions made to your HSA, regardless if you are the sole contributor or your employer contributes as well. These contributions are adjusted to your gross income and remain in your HSA until you need them. So, even if you change employer or retire, your HSA contributions are yours. You are married with two children and you earn $90,000 annually, out of which you put the maximum allowed tax-free contribution of $6,750 into your HSA. Your employer matches the first $500, so you get another $1,000 annually, which makes up to a total contribution of $7,750. With $90,000 annual income, you fall under the 25% tax bracket. So, your annual contribution lowers your taxable income to $82,250, and your annual tax savings are (7,750 x 25%) x 12 = $23,250. If at the end of each year you leave $11,625 to be rolled over to the next year, after 20 years you will have more than $305,000 with a modest 5% rate of return. If you leave the entire amount of $23,250 to be rolled over the next year, after 20 years you will have you will have more than $610,000. Of course, this presupposes that you have a health care pension plan that can cover for medical expenses. Now, if you put less than the maximum contribution into your HSA, let’s say $4,000, this $2,750 less will cost you $100,000 after 20 years. You can create a simple Excel spreadsheet like this and play with the numbers. Nevertheless, have in mind that the more you leave your HSA account undisturbed, the better. To be eligible for an HSA, you should be covered by a high-deductible health plan (HDHP) with a deductible of $1,300 at least for single coverage and $2,600 at least for family coverage. The out-of-pocket limits are $6,550 for single coverage and $13,100 for family coverage. Also, you must not be enrolled in Medicare and you must not be a dependent on someone else’s tax return. A full 401k or HSA match provided by an employer is essentially a 100% return on your money. You can’t find those kinds of returns anywhere else.